Diurnal (a book containing the daytime offices for the canonical hours of prayer), with 309 folios (ff.) and 1 leaf. Pages contain 1 column of 16 text lines in Latin. Bounding lines in brown ink, full-length to all edges, writing lines in brown ink, top line doubled, prickings preserved in outer margin for writing lines, in lower outer and inner margins for bounding lines. Lacking first two leaves, f. 5 is a tipped-in blank singleton. 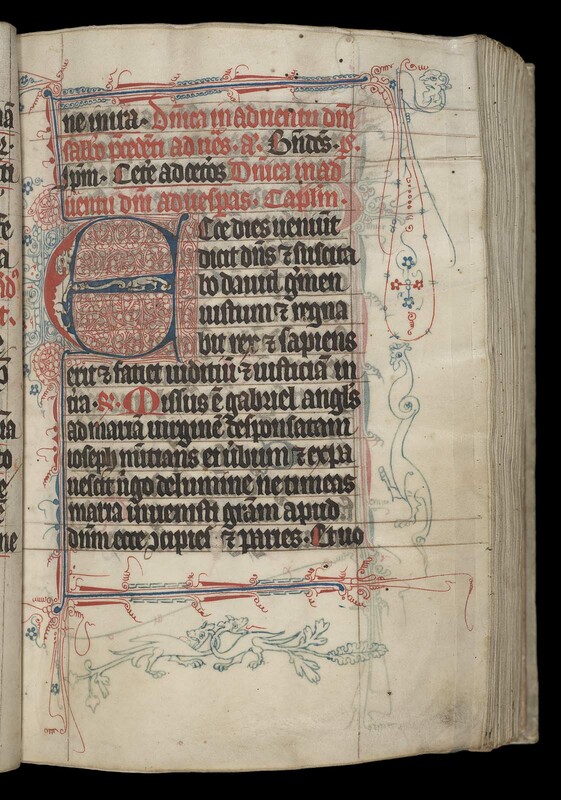 Catchwords in lower right corner of last verso of each quire, framed. Written in a Gothic bookhand in black ink with red rubrics. 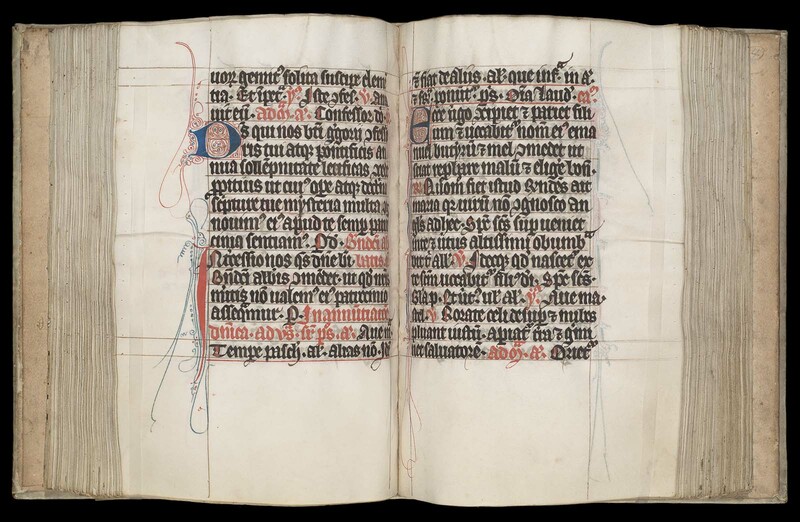 f. 8: five-line initial in blue with red infill and blue and red filigree into all margins, with grotesques; two- to three-line initials throughout in red with blue filigree or vice versa, occasionally extending the full length of the outer margin. A 17th-century French binding with vellum over pasteboards, with brown ink fillet border on front and back, title on spine reads “Livre d’Heures”, paper pastedowns, braided endband of brown and white thread, all edges gilt. 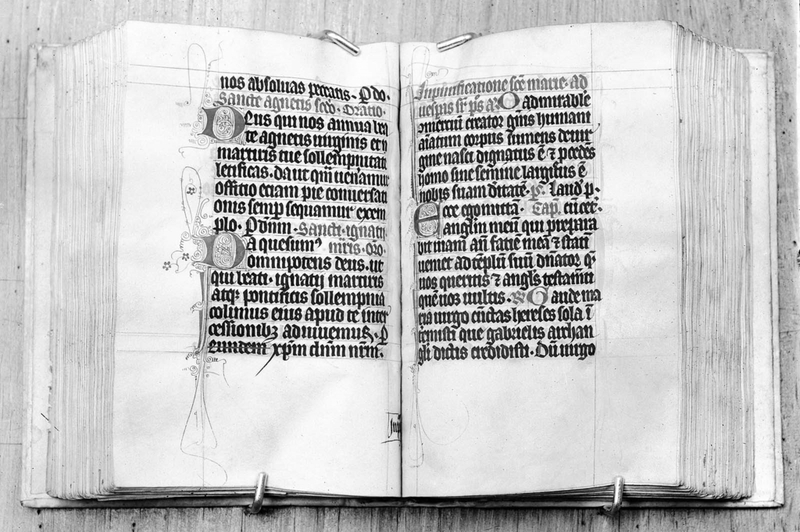 Knotted threads attached to outer edge as bookmarks for the offices of St. Dominic, the common of “Omnium fidelium defunctorum,” and the ferial diurnal. Written for use by the Dominican order in the first half of the fourteenth century. The calendar includes the Transitus of St. Dominic (23 May), the feast of Dominic (5 August) and his octave (12 August), as well as the Dominican commemorations of “the blessed brothers of our order” (5 September) and “all the brothers of our order” (10 October). St. Thomas Aquinas, a Dominican saint, is not included in the sanctorale, implying that the manuscript may pre-date his canonization in 1323 (the calendar page that would have included his feastday is lacking).